1. Prepare a briefing note to your "company" summarising how wastes are managed in the State/Territory in which you are based. 2. 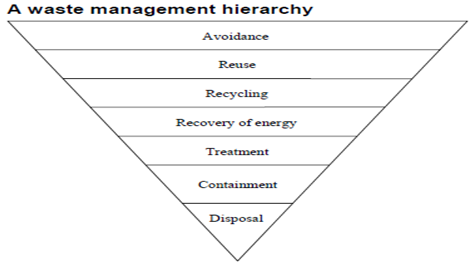 Describe how it should be managed in accordance with the waste management hierarchy.Are there any legisative issues? What policies exist that may influence the materials management and how? 3. Explain the specific waste management issues relevant to the site under investigation and provide practical recommendations on how waste can be reduced over time. 1. The National Waste management Policy has opened up new doors to the effective waste management treatment in Australia. The terms and legislations of the policy were agreed upon by all the Australian Environment ministers in November, 2009 and the aims of achieving resource recovery and management of the wastes till 2020, were set. There is a lingering history of collaborative efforts of the Government of Australia, in effective treatment and waste management. The very first comprehensive approach for waste management was agreed by the Government of Australia under the 1992 National Strategy for Economically Sustainable Development by the counsil of Australian Government. The policy aimed at increasing the efficiency with which the resources were being utilized and thereby simultaneously reduce the impact of waste disposal on the environmental (AGDE 2013). With time, the nature of waste has changed a lot. With more complex goods, more amount of landfill is being produced. This change in the complexity of the goods and the waste being produced has significantly reduced the capacity to recover the resources. The major aims of this policy are to avoid the generation of waste and therefore, reduce the amount of waste for disposal, including the hazardous waste. Secondly, the aim of the policy is to initiate the management of waste as a resource. Thirdly, the responsibility of the government is to ensure proper waste treatment, recovery, disposal and re usability. This means all these activities should be carried out in a safe, scientific and environmentally sound manner and lastly the policy also aims to contribute in the reduction of greenhouse gas emissions, conservation of energy and its production, efficiency of water and also the productivity of the land (AGDE 2013). The management of waste in Australia has become a serious issue now. For all the types of wastes different organizations and policies are being set up by the Government in order to regulate the disposal, treatment and re usablity activities. 2. The most common type of waste material that is present in Australia is the Hazardous waste. According to the Hazardous Waste (Regulation of Exports and Imports) Act 1989, Hazardous wastes can be defined as the waste that has any of the following characteristics: explosive, toxic, flammable solid/ liquid, poisonous, ecotoxic and is an infectious substance (AGDE 2013). The control of Hazardous waste in Australia is done via Hazardous Waste ((Regulation of Exports and Imports) Act 1989, according to which the import and export of the waste is regulated within the country. This act ensures that this waste is disposed of safely such that the humans and animals, inside and outside Australia, are protected from the harmful effects of the waste. The original Act of 1989 was responsible for controlling the movement of waste that did not have any financial value and was destined for final disposal operations through incineration or landfill. But in 1996, the Act was amended and the wastes that had a financial value and that were destined for the purpose of recycling and recovery operations, were also included in the list (AGDE 2013). The international movement of Hazardous waste is managed by the Basel Convention, which is an international treaty that has been designed to regulate and reduce the export and import of hazardous waste between nations. This Convention was brought into force in 1992 and now around 170 nations are its members. Dangerous waste alludes to the solids, fluids, or contained gasses produced by modern methods that represent a generous present or potential peril to human wellbeing or nature when despicably treated, put away or arranged. Illustrations of basic risky squanders incorporate spent auto batteries, spent solvents, and slimes from modern wastewater treatment units. Over late years the measure of perilous waste has expanded because of various components including: populace development and the related increment popular for merchandise and administrations; development in exchange substance items and expanded utilization of oils, pesticides, acids and salts; an increment in the measure of dangerous parts in family squander; and enhanced medicinal services which has prompted more clinical and pharmaceutical waste (Australian Bureau of Statistics 2013). The Environmental protection Act (EPA) permits the householders to bring their waste to the Household Hazardous Waste Depot which is operated by Zero Waste SA. Some of the waste materials like paint, sealants, varnish and the adhesives can be disposed of along with the normal garbage. Waste that is generated from the business and the government agencies is not acceptable and such waste needs to be disposed with the help of commercial waste treatment companies. Part time farmers or full time farmers are the primary producers and they generate waste in form of unwanted agricultural chemicals. This form of waste needs to be disposed with the help of industry based ChemClear that is funded by the industries. According to the Environment Protection (waste Resources) Policy 2010 (W2R EPP) the disposal of hazardous waste to landfill in metropolitan Adelaide and the other remote and regional areas South Australia. This Act should be seen as a stimulation for the industries and the individuals to change the way they perceive hazardous waste and most importantly its generation and disposal. The Government of Australia ensures that all the individuals should employ the waste avoidance approach to hazardous waste generation and therefore, strive to work in the direction of cleaner nation. This in return shall also help in developing the social, economical and environmental practices of the country (EPA 2014). Along with the hazardous waste, medical waste also has specific licensing and management steps and requirements that need to be fulfilled by the people of the country so as to ensure a clean and safe environment. There are many legislations/ Acts related to waste management like Section 10: objects of the Act, which aimed to prevent, eliminate or minimize the harm to the environment; Section 25: General Environment Duty, which plots the obligations of an individual, whether authorized, when undertaking an action that may dirty the earth, to take all sensible and practicable measures to forestall or minimize ecological damage; and many more sections (EPA 2014). Australia's radioactive waste originates from two primary sources: mining exercises and the utilization of radionuclides in exploration, drug and industry. In Australia, makers of radioactive waste are in charge of taking care of the waste that they create, and each of the Federal, State and Territory governments is capable for managing the radioactive waste produced inside its ward. Given the little measures of radioactive waste created in Australia, it is in fact and financially wasteful, and in addition unrealistic, for capacity and transfer offices to be built inside every locale. Accordingly, very nearly 50% of Australia's radioactive waste is put away at clinics and colleges in more than 50 separate areas around Australia. The waste management policies of Australia have to be developed in order to identify the potential facilities and sites across Australia which store, receive, process, dispose and treatment of hazardous waste even if they are in liquid, sludge forms or solids. The rationale for development of waste management strategies was to identify the potential waste prone areas and also their impact on the environment and then work in the direction to reduce and minimize the harmful effects of the waste being disposed. Numerous State and Territory Governments have created waste administration procedures based around the idea of the waste order. Under this methodology, waste shirking is contended to be desirable over reuse, reuse to reusing, etc. Transfer is seen to be the minimum attractive choice. In consistence with this approach, numerous purviews have set focuses for occupying waste, some going so far as to go for zero waste to landfill. This methodology is conflicting with great strategy standards. Some of the legislations and the jurisdictions aim in subsidizing the installation of alternative waste technology facilities either directly or indirectly (for municipal waste). The waste management policy aims to achieve the best potential outcomes for the community. Yet locales' adherence to the waste order and waste preoccupation targets can support strategy choices that have higher net expenses to the group than other plan B (AGPC 2006). The methods used for waste management were well defined. The dataset was prepared by keeping in mind the sites and facilities which were linked to the storage, processing, treatment and disposal of the hazardous wastes. The dataset does not include sites where the hazardous wastes were originally generated for example the manufacturing sites. The smelters and cement kilns are excluded as they are not considered hazardous waste disposal facilities. It does exclude locales and offices that oversee oil trap, sewerage and modern wash waters (e.g. composting offices, sewerage treatment plants) or locales that discard asbestos and tires (e.g. landfills), with the exception of where those locales additionally oversee different perilous squanders. This is on account of those locales are not generally considered as dangerous waste treatment or transfer offices. Isolate waste offices are rejected from the degree (AGPC 2006). Various E-waste offices are incorporated, focussed on real offices that attempt physical/compound treatment or dismantling. It is perceived that there are different offices which manage risky squanders that are excluded in the dataset, for example, littler storerooms and exchange stations. To the degree conceivable, multi-use offices that additionally handle unsafe waste are incorporated in the dataset. This incorporates landfill destinations. Finnveden et al has given two major approaches for environmental assessment- one is the procedural approach and analytical methods. In the procedural methods, the society is being represented. These methods include the decision making events. In the analytical methods, the focus is more on the technical aspect of the analysis. One of the most commonly used analytical approach is the Life Cycle analysis (LCA) or the cradle-to-grave analysis. LCA is a method to assess the performance of the assessment being conducted for the environment. The design of the process of LCA is such that it contains four major steps: definition of goal and scope, inventory, analysis of the impact and finally the interpretation (AGPC 2006). Contingent upon the suitability of the host site, low level and brief moderate level waste will be discarded in a close surface vault. Enduring middle of the road level waste will be put away in a different building (see underneath). Under the NHMRC characterization plan, low-level radioactive waste incorporates such things as gently defiled apparel, lab supplies and soil and smoke finders. It contains just little measures of radioactive material. (A smoke locator, for instance, contains just around 40 kbq of movement.) It doesn't oblige protecting amid taking care of and transport, it displays a low radiation risk, and it is suitable for shallow area entombment. Middle of the road level radioactive waste may incorporate spent or neglected radiation sources from industry or healing facilities, tars, compound slimes and metal atomic fuel cladding. Such waste may oblige radiation protecting to permit safe taking care of (AGPC 2006). The Waste Minimization Program prerequisites apply to both assembling plants, and in addition remediation just destinations. Waste Minimization incorporates source diminishment and naturally sound reusing. While the regulations don't oblige generators to have a composed portrayal of their waste minimization program, it is prescribed that an office report its program and have that documentation marked by the corporate officer in charge of guaranteeing agreeability. In Arkansas, Permitted locales (both business and non-business) have Permit conditions that require the office to submit a composed arrange every year depicting their earlier years waste minimization endeavors. Lastly, the financing of the waste management programs is done by the State and Territory Governments, such that each of the governments finance their own waste management schemes and the associated development and research programmes. All these programmes are financed through the direct funding by the government expect in the areas like Western Australia and Queensland. In these areas the waste management schemes are funded partly by the fees that is imposed on the people who accept the waste and then plan for its treatment, and disposal (National Nuclear Energy 2011). Australian Bureau of Statistics, 2013, Hazardous Waste, viewed on 18th January 2015, https://www.abs.gov.au/ausstats/abs@.nsf/Products/4602.0.55.005~2013~Main+Features~Hazardous+Waste?OpenDocument. Australian Government Department of the Environment (AGDE), 2013, About the National Waste Policy, viewed 18th January 2015, https://www.environment.gov.au/protection/national-waste-policy/about. Australian Government Department of the Environment (AGDE), 2013, What is hazardous waste? viewed 18th January 2015, https://www.environment.gov.au/topics/environment-protection/hazardous-waste/about-hazardous-waste-act/what-hazardous-waste. Australian Government Productivity Commission (AGPC), 2006, Waste management, Productivity Commission inquiry Report, Report no. 38, Canberra. Environment Protection Act (EPA), 2014, Hazardous waste, viewed on 18th January 2015, https://www.epa.sa.gov.au/environmental_info/waste/hazardous_waste. National Nuclear Energy, 2011, Radioactive waste management programmes in OECD/ NEA member countries, Australia.